From the Bench with Francis is a regular column on craniofacial news and technology by Dr. Francis Smith. 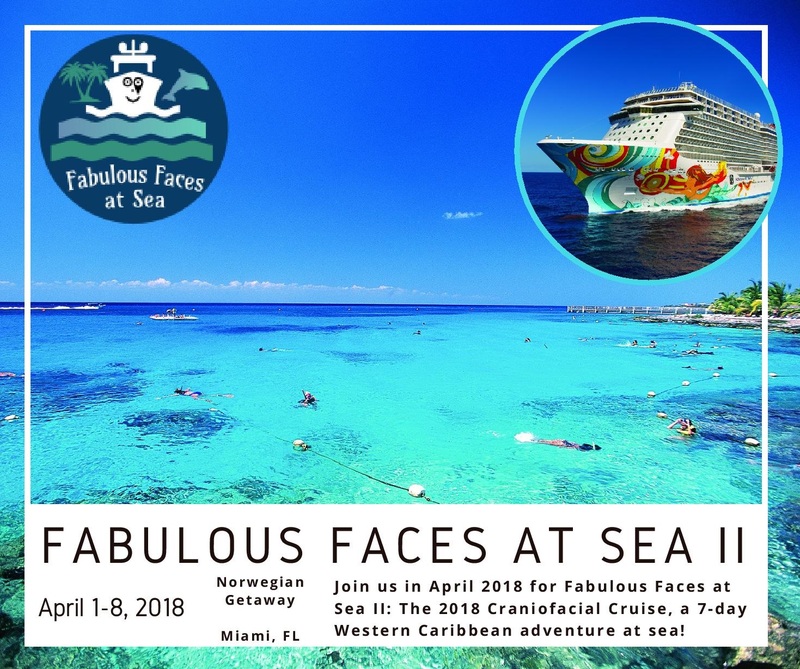 Join us in April 2018 for our second Fabulous Faces at Sea Craniofacial Cruise, on the beautiful Norwegian Cruise Line vessel Norwegian Getaway! With the help of my travel agent in the Denver, CO, area, I am organizing and hosting the Fabulous Faces at Sea cruise. We inaugurated this cruise in August 2016 as a way for individuals and families with craniofacial differences to get together as a group on a Caribbean cruise. For the 2018 cruise, we are targeting adults with craniofacial conditions (and the activities will be focused on adults), however families are just as welcome to join us. I would also encourage craniofacial medical and scientific professionals to join us. There will be group-specific shipboard activities as well as a group shore excursion. Guest speakers will be announced soon. For the 2018 cruise, we will be sailing aboard Norwegian Getaway, departing Miami on April 1, 2018, and visiting Roatan (Honduras), Harvest Caye (Belize), Costa Maya (Mexico), and Cozumel (Mexico), before returning to Miami on April 8, 2018. For more information, and to book, please contact my travel agent, Linda Eyer, CTC, at Highlands Ranch Travel in Highlands Ranch, CO. Contact her via email (linda@hrtvl.com) or by phone at (303) 791-2311, or toll free at (800) 275-4669. On the August 2016 inaugural cruise, we had a number of group-specific activities both aboard ship and ashore. My mother accompanied me as I hosted our small group in a seminar where she and I answered questions about our experiences (her parenting experience and my life experience with Treacher Collins syndrome). On another day, we had an ice cream social. Our group shore excursion visited a beach and aquarium on the island of St. Thomas in the US Virgin Islands. Our 2016 cruise visited St. Maarten, St. Thomas, Tortola, and Nassau. Here are some photos from the 2016 cruise.